Cranberry or Vaccinium macrocarpon, has long been known for its beneficial effect in urinary tract health and to help reduce the frequency of recurrent cystitis. Vaccinium macrocarpon was first recognised for its urinary health benefits in the 1800s.1 Today, cranberry supplements are commonly used to help reduce the frequency of recurrent cystitis. 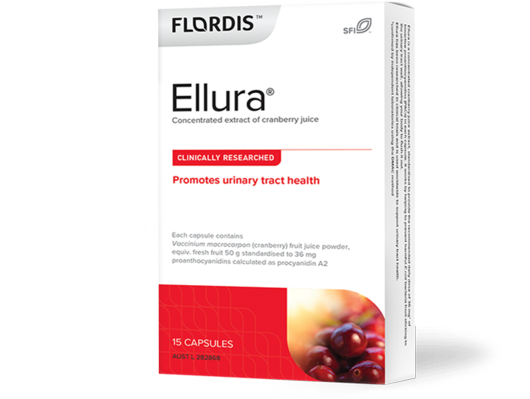 Discover more about the scientifically formulated extract of cranberry used in Flordis Ellura and key studies that support its benefits. Cranberry supplements are not necessarily created equally. Different products can contain varying amounts of an active ingredient known as proanthocyanidins (PACs). In Ellura a specialised process is used to ensure 36 mg of PACs is in every capsule. This is the dose of PACs that has been researched and recommended worldwide to support urinary tract health. The PACs contained in cranberry can be fragile, meaning they can be easily degraded by heat or oxidation. That’s why the production process is essential in preserving the concentration of PACs in the finished product.8 That’s why in Flordis Ellura a specialised process is used to ensure the recommended dose of 36 mg of PACs is in every capsule of Ellura. Clinical research has shown that the daily consumption of 36 mg of PACs from cranberry can help reduce the frequency of recurrent cystitis.3-6 Therefore it is important to ensure the product you take has 36 mg of PACs in the dose so you can more feel more confident it will have the same results as in the research. Ellura is a concentrated cranberry extract that is standardised to provide the recommended 36 mg of PACs in each one-a-day capsule. This medicine may not be right for you. Read the warnings before purchase. 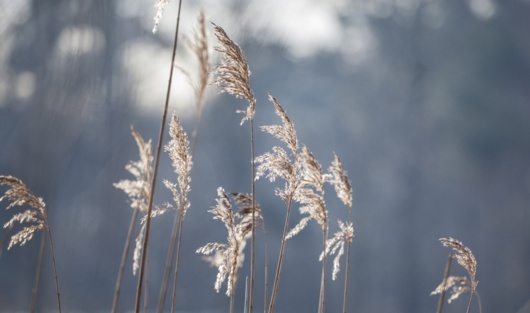 These can be found in the dosage and directions sections of the Ellura product web page. Follow the directions for use. If symptoms persist, talk to your health professional. Natural healthcare products can vary considerably depending on how they are produced. Ellura follows a meticulous production process with careful consideration to ensure a consistent form and quantity of PACs in every batch. Ellura is made from the pure juice concentrate of the American cranberry. Based on years of research, a proprietary production process has been developed that removes the seeds, stems and skins of cranberry. This ensures you get consistently high levels of the active ingredient PACs. 36 mg of PACs is the recommended dose demonstrated to help to flush away harmful bacteria. That means, you can be confident that the Ellura product you are getting contains the same ingredient, in the same amounts that has demonstrated benefits for urinary tract health in clinical research. That's the Flordis difference. Rigorous processes, quality controls and extensive testing help ensure that the concentrated cranberry extract is the same as that tested in clinical research. to support urinary tract health and help to reduce the frequency of recurrent cystitis. Braun, L & Cohen, M (eds). Herbs and Natural Supplements: An evidence-based guide. 2014; 138. Howell AB et al., BMC Infectious Diseases 2010:94:1-11. Bianco L et al., J Am Geriatr Soc 2012; 60:1180-1. Botto H & Neuzillet Y., Scand J of Urol and Nephrol 2010; 44: 165-8. World Health Organization. WHO monographs on selected medicinal plants Volume 4. World Health Organization. Geneva, 2009. Jepson RG et al., Cochrane Collaboration 2012; 10. Funding for the 2012 update provided by the UK NHS NIHR. Prior RL et al., J Sci Food Agric 2010; 49:1270-1276. Standardized Testing Method for Cranberry Products. Available: here. Accessed October 2018. Agrobio Laboratories, Report on proanthocyanidins of cranberry products in Australia, 2013. Mayo Clinic. Cystitis Overview available: here. Accessed October 2018. Foo et al., J Nat Prod 2000, 63:1225-1228.